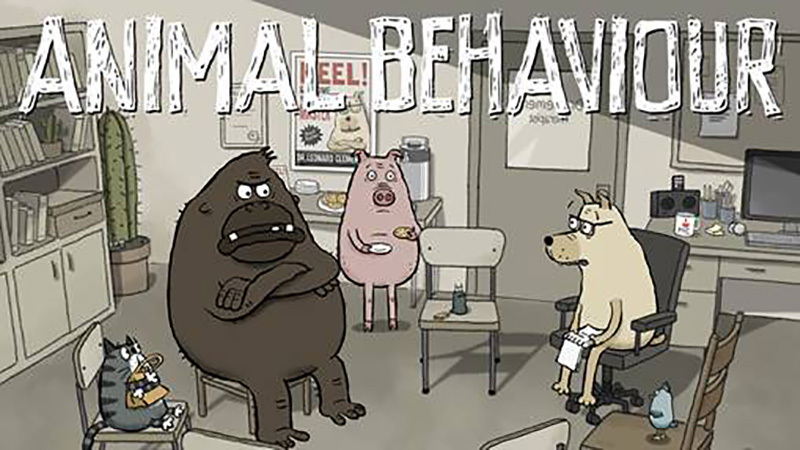 (January 22, 2019 – Toronto, ON) The Vancouver-based Oscar-winning animation duo of Alison Snowden and David Fine has received another Academy Award nomination—for their hilarious new National Film Board of Canada (NFB) animated short Animal Behaviour, taking us inside a group therapy session for animals who grapple with issues not unlike like our own. Animal Behaviour is produced and executive produced by Michael Fukushima for the NFB’s English-language Animation Studio in Montreal. The NFB is bringing all Canadians into the Oscar celebration with two weeks of free streaming of Animal Behaviour, from February 11 to 24 on NFB.ca, Facebook, Vimeo and YouTube. “The NFB has long been recognized as the home of great animation storytelling, thanks to one-of-a-kind filmmakers like Alison and David. It’s been fantastic to welcome them back and work with them to bring another wonderful story to life. Congratulations to producer and executive producer Michael Fukushima and to everyone who’s contributed to Animal Behaviour―it’s an exciting day for the NFB and for Canada,” said Claude Joli-Coeur, Government Film Commissioner and NFB Chairperson. A little Oscar history: Animal Behaviour marks the fourth Oscar nomination for the husband-and-wife team. Twenty-four years ago, Toronto-born David Fine and UK-born Alison Snowden received the Academy Award for Best Animated Short for the NFB/Snowden Fine Animation/Channel 4 co-production Bob’s Birthday, which would go on to inspire their series Bob and Margaret. They were also nominated previously for their 1987 NFB short George and Rosemary, with Snowden nominated before that for her 1984 student film Second Class Mail. As for the NFB, it’s received 12 Oscars over its 79-year history, including a 1989 Honorary Academy Award for overall excellence in cinema. This is its 75th Academy Award nomination—more than any other film organization based outside of Hollywood. The 91st Academy Awards will take place Sunday, February 24, 2019, at Hollywood’s Dolby Theatre. Dealing with what comes naturally isn’t easy, especially for animals. In Animal Behaviour, five animals—including a leech who suffers from separation anxiety and a bird with guilt issues—meet regularly to discuss their inner angst in a group therapy session led by Dr. Clement, a canine psychotherapist. This hilarious yet emotional short looks at whether we should learn and adapt—or should others just accept our true nature? Animal Behaviour has garnered eight awards to date, winning the Grand Prix at Rio de Janeiro’s Anima Mundi festival. It’s been honoured by LA’s animation community, winning Best Comedy and Best Direction at the Los Angeles Animation Festival. Here in Canada, it received the Prix Animé TVA Abitibi-Témiscamingue at the Festival du cinéma international en Abitibi-Témiscamingue. It has also received no less than four audience awards to date, with festivalgoers picking it as their favourite at Cinéfest Sudbury; the International Weekend of Animation in Wiesbaden, Germany; Kraków’s International Film Festival Etiuda & Anima; as well as the Festival Court, c’est COURT! in Cabrières d’Avignon, France. Also see: The 91st Oscar® Nominations telecast replay.